Following a collaboration between Topdrim members from the Camerino University and The Open University, the paper Neural hypernetwork approach for pulmonary embolism diagnosis by Rucco, Sousa-Rodrigues, Merelli, Johnson, Falsetti, Nitti and Salvi was recently published in BMC Research Notes. The method constructs a Neural Hypernetwork to identify the patients with pulmonary embolism and presents the advantage of not using invasive clinical parameters obtained by imaging techniques still yielding better results that previous similar approaches. Hypernetworks are based on topological simplicial complexes and generalize the concept of two-body relation to many-body relation. Furthermore, Hypernetworks provide a significant generalization of network theory, enabling the integration of relational structure, logic and analytic dynamics. A pulmonary embolism is a blockage of the main artery of the lung or one of its branches, frequently fatal. Our study uses data on 28 diagnostic features of 1427 people considered to be at risk of pulmonary embolism enrolled in the Department of Internal and Subintensive Medicine of an Italian National Hospital “Ospedali Riuniti di Ancona”. Patients arrived in the department after a first screening executed by the emergency room. The resulting neural hypernetwork correctly recognized 94 % of those developing pulmonary embolism. This is better than previous results obtained with other methods (statistical selection of features, partial least squares regression, topological data analysis in a metric space). 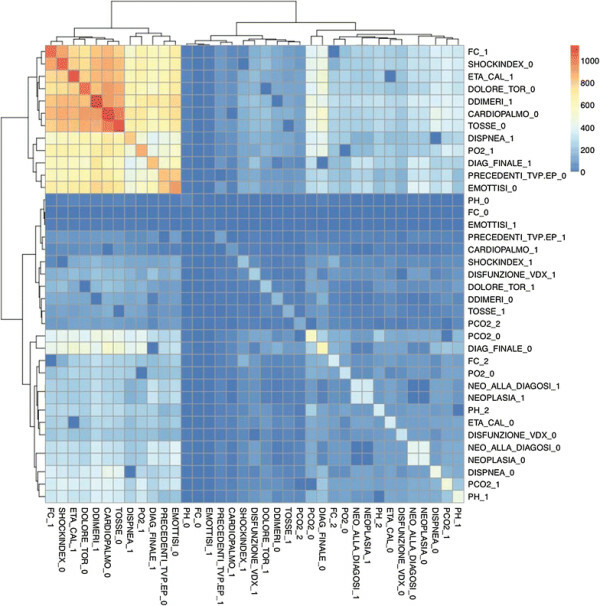 In this work we successfully derived a new integrative approach for the analysis of partial and incomplete datasets that is based on Q-analysis with machine learning. The new approach, called Neural Hypernetwork, has been applied to a case study of pulmonary embolism diagnosis. The novelty of this method is that it does not use clinical parameters extracted by imaging analysis. The paper was published in BMC Research Notes under Open Access and the full paper is available in PDF from the Topdrim Website. Artbotics event at ICT 2015 – Towards a Roadmap for Mathematics in the context of Dym-CS. 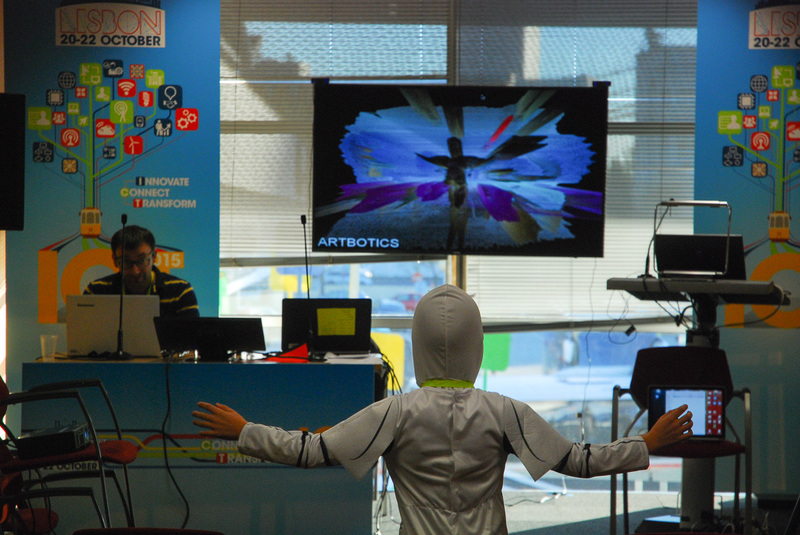 Topdrim presented the world’s first Artbotics-Mathematics Extravaganza session at the Lisbon ICT 2015 conference. 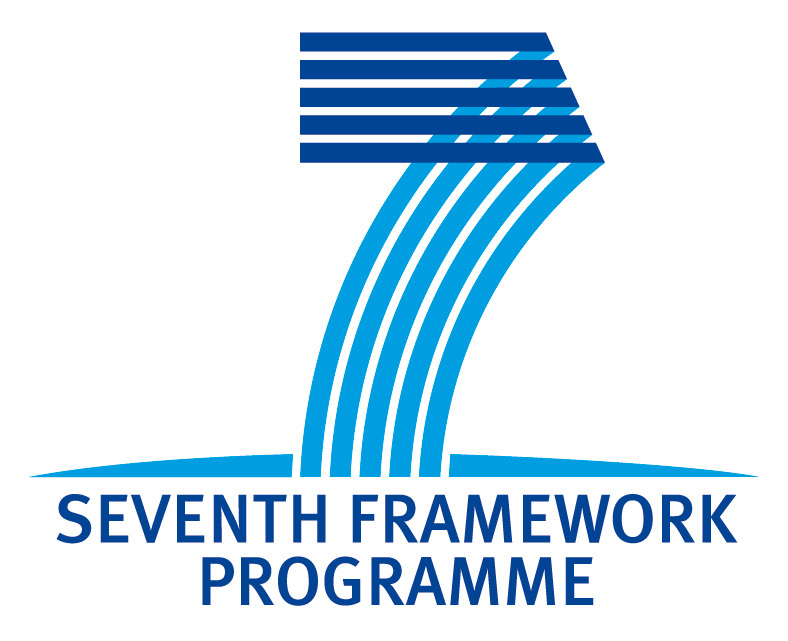 The conference was organized by the European Commission and the Portuguese Science Foundation and comprised many parallel activities, including a conference on policy, networking sessions, H2020 thematic sessions and a startup forum. The Artbotics-Mathematics event was a networking opportunity aimed to increase the visibility of mathematics research as a fundamental pillar of future ICT calls. It was also an opportunity to discuss with fellow participants the need of establishing a roadmap for mathematics within the EU funding schemes and in particular in the context of the DyM-CS projects. The idea behind Artbotics is to capture the views of the audience by them waving greed cards (I agree) or red cards (I don’t agree). This audience participation is captured by machine vision systems and used for interaction with a robot artist influencing the way it creates dramatic animated displays. This was the world premier of a new Artbotics Project initiated by Topdrim and the Open University, aimed at engaging wide audiences for the dissemination of socially important new ideas in mathematics, science and ICT. 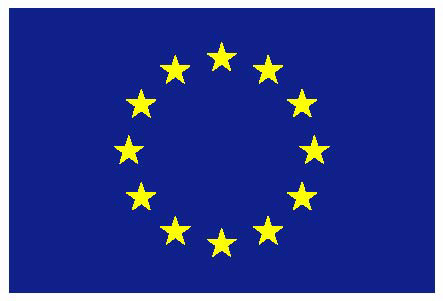 This event targeted the European ICT community, while future events will be aimed at other audiences including policy makers, industry, students, and the general public. The underlying principle is engaging audiences to disseminate scientific ideas and their applications through a combination of interactivity, art, creativity and fun. Participants of the event involved Topdrim partners Jeffrey Johnson, David Sousa-Rodrigues, Armando Marino from The Open University and Emanuela Merelli from the University of Camerino. 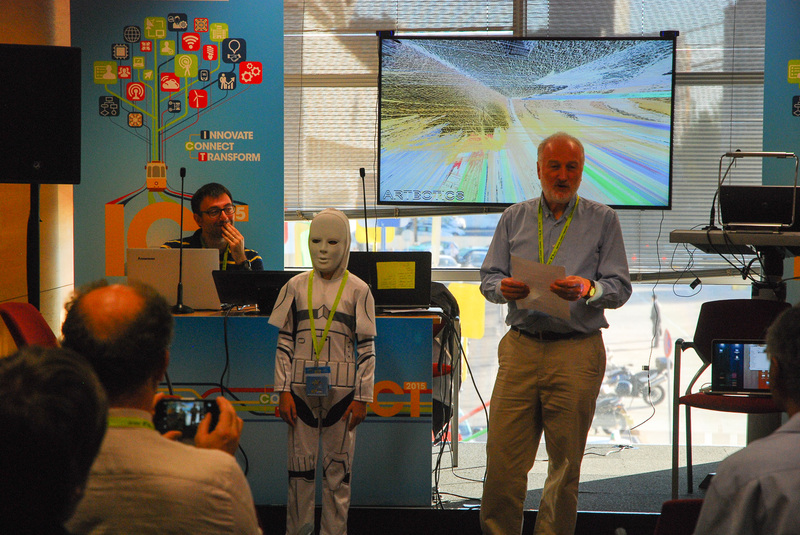 The Artbotics team also included Jorge Louçã from the Lisbon University Institute, and Mariana Louçã as the Robot. 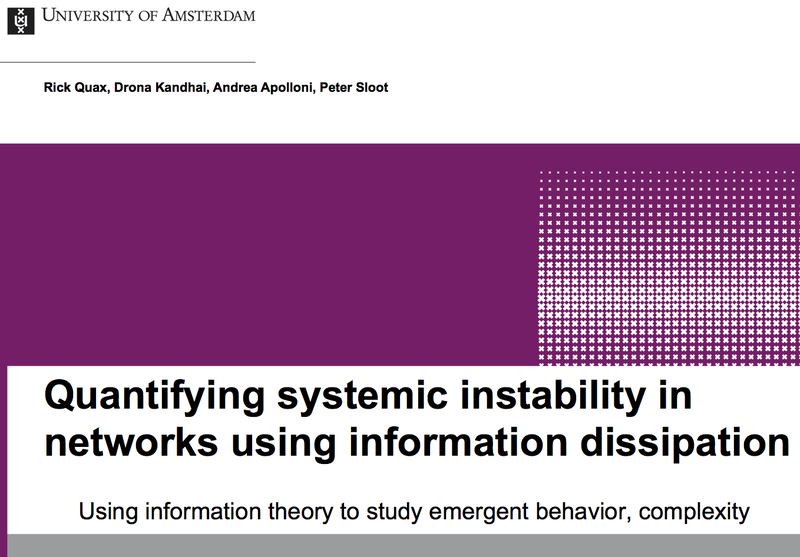 Following the European Conference on Complex Systems, the paper Characterisation of the idiotypic immune network through persistent entropy by Rucco, Castiglione, Merelli, and Pettini is to appear in the proceedings of the conference soon to be published. 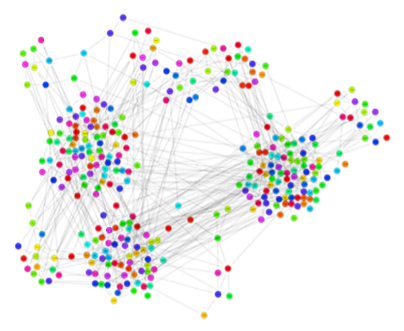 Rucco, M; Castiglione, F; Merelli, E; and Pettini, M; Characterisation of the idiotypic immune network through persistent entropy; in proceedings of the European Conference on Complex Systems, 2014, Lucca, Italy. 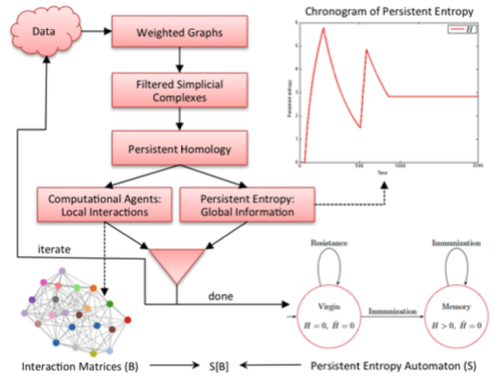 Topdrim partners Merelli, Rucco and Tesei, from the University of Camerino and Sloot from the University of Amsterdam, just published a paper on the Topological Characterization of Complex Systems: Using Persistent Entropy. In this paper, the authors propose a methodology for deriving a model of a complex system by exploiting the information extracted from topological data analysis. This builds on previous work by Merelli on the S[B] paradigm. The paper is to appear in the journal Entropy. 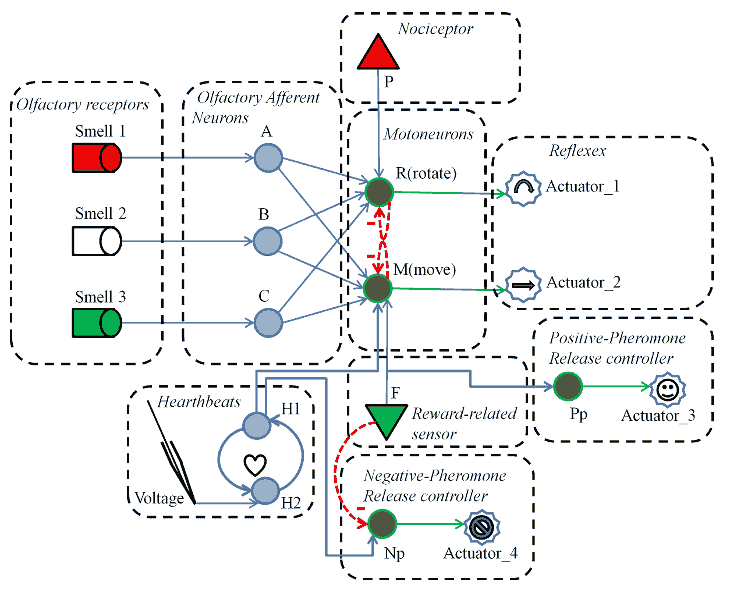 A model of an Ant System where ants are controlled by a spiking neural circuit and a second order pheromone mechanism in a foraging task is presented. A neural circuit is trained for individual ants and subsequently the ants are exposed to a virtual environment where a swarm of ants performed a resource foraging task. The model comprises an associative and unsupervised learning strategy for the neural circuit of the ant. The neural circuit adapts to the environment by means of classical conditioning. The initially unknown environment includes different types of stimuli representing food (rewarding) and obstacles (harmful) which, when they come in direct contact with the ant, elicit a reflex response in the motor neural system of the ant: moving towards or away from the source of the stimulus. The spiking neural circuits of the ant is trained to identify food and obstacles and move towards the former and avoid the latter. The ants are released on a landscape with multiple food sources where one ant alone would have difficulty harvesting the landscape to maximum efficiency. In this case the introduction of a double pheromone mechanism (positive and negative reinforcement feedback) yields better results than traditional ant colony optimization strategies. Traditional ant systems include mainly a positive reinforcement pheromone. This approach uses a second pheromone that acts as a marker for forbidden paths (negative feedback). This blockade is not permanent and is controlled by the evaporation rate of the pheromones. The combined action of both pheromones acts as a collective stigmergic memory of the swarm, which reduces the search space of the problem. This paper explores how the adaptation and learning abilities observed in biologically inspired cognitive architectures is synergistically enhanced by swarm optimization strategies. The model portraits two forms of artificial intelligent behaviour: at the individual level the spiking neural network is the main controller and at the collective level the pheromone distribution is a map towards the solution emerged by the colony. The presented model is an important pedagogical tool as it is also an easy to use library that allows access to the spiking neural network paradigm from inside a Netlogo—a language used mostly in agent based modelling and experimentation with complex systems. Co-authored by Cristian Jimenez-Romero, David Sousa-Rodrigues, Jeffrey Johnson and Vitorino Ramos and available in arXiv 1507.08467 and Researchgate, this will be presented latter this year at UKCI 2015. 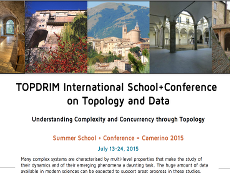 Topdrim organised a Summer School on “Understanding Complexity and Concurrency through topology of data” during the past month of July. The Summer School took place at the University of Camerino and was co-located with the 2nd EATCS young researcher School. The 35 students had the opportunity to engage with more than 15 professors, that are specialists in diverse fields including Topology, Computer Science and Mathematics. Besides the summer school, a two day conference on Topology Driven Methods for Complex Systems was held on July 18th and on July 22nd. This included keynote talks by Samson Abramsky from Oxford University, Seth Lloyd from MIT and Mario Rasetti from Topdrim partner ISI. 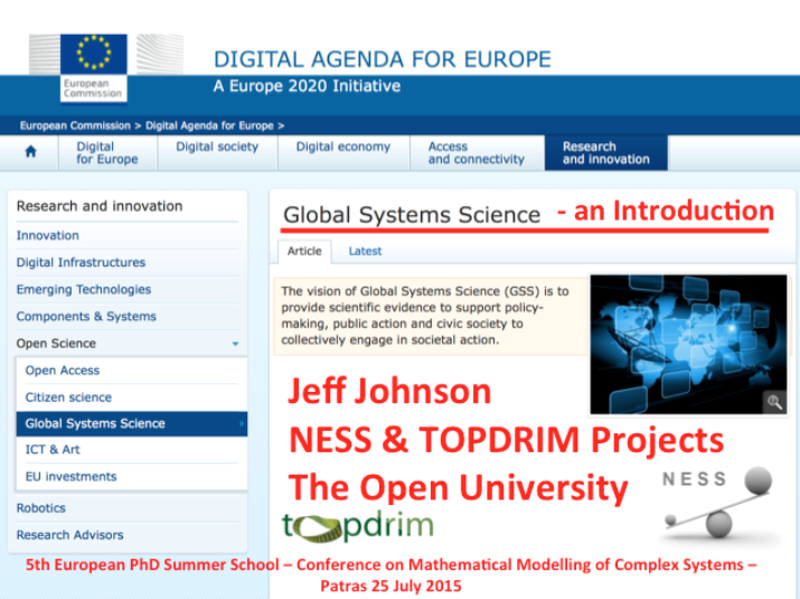 More photos and information on the event are available from the Topdrim Summer School 2015 website. 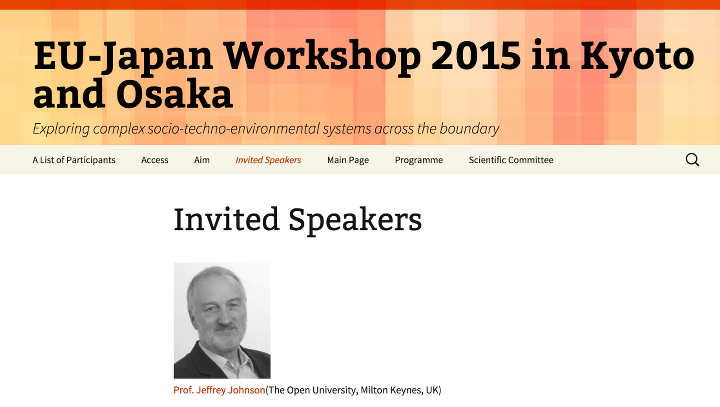 Professor Jeffrey Johnson has been invited as a keynote speaker at the EU-Japan Workshop 2015 – Exploring complex socio-techno-environmental systems across the boundary. 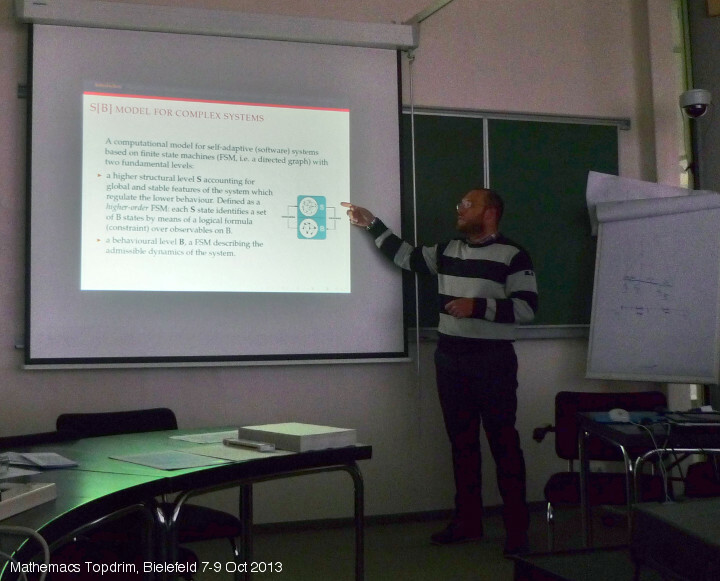 His presentation was entitled Multilevel Dynamics and Local Policy in Global System Science. The workshop took place in Kyoto and Osaka, during the month of March and was set to share visions to investigate socio-techno-environmental systems based on rich data with both European and Japanese researchers, and to allow the exchange of new ideas based on current state-of-the-art. The workshop was a participatory workshop where participants were invited to propose a project developed during the workshop in small working groups. Organisers set as goals the mutual understanding of the different fields and the finding of opportunities of sustainable development. A handout of the presentation is available for download. 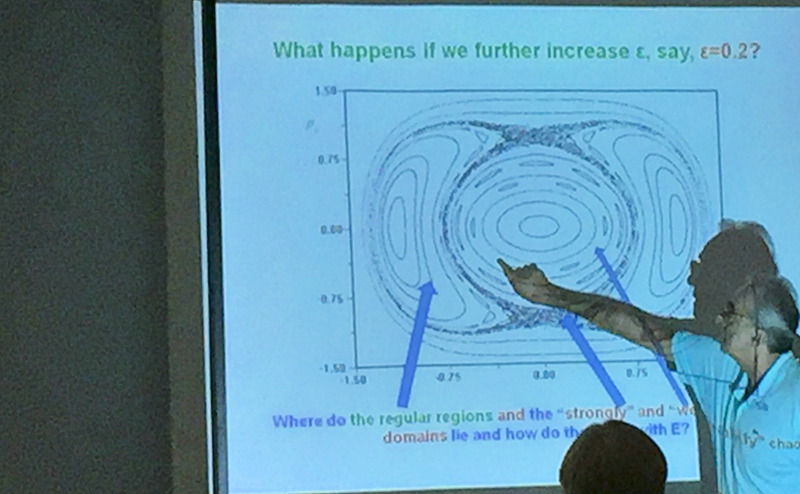 On Friday January 16 Rick Quax, from the Universtiy of Amsterdam, presented an invited keynote lecture to about 60 people (mostly psychology, clinicians, and statisticians) in an event called “Time Series and Dynamical Models” in Amsterdam. The title of his talk is “Information dissipation and tipping points” and download of the slides is available. Emergent behaviour is the process where a large collection of elements (termed ‘agents’) generate a complex systemic behaviour. Examples include human cognition emerging from a network of neural cells, ecosystems from food webs, and cellular regulatory processes from protein-protein interactions. A first important question is: which agents are the ‘drivers’ of the systemic behaviour? A second question is: can we detect emergent phenomena, particularly ‘criticality’ (susceptibility to small perturbations)? We address these questions using the concept of ‘information dissipation’ which we are developing. This is the idea that Shannon information is first stored in an agent’s state, and then percolates through the network due to the agent-agent interactions. I will present recent work on addressing the above questions through analytical results, computational modeling and real data analysis of financial derivatives data around the Lehman Brothers collapse. Rick Quax is a postdoctoral researcher in the Computational Science in the Faculty of Science of the University of Amsterdam. He is particularly interested in the emergence of complex, systemic behavior from the interactions of relatively simple elements, such as human cognition from neurons and synapses, cell regulatory processes from gene-gene interactions, and social unrests and protests through person-person communication. Topdrim member Matteo Rucco, from Camerino University, presented some of his recent findings on Topological Data Analysis Applied to Idiotypic Network in a meeting at the Institute for Computing Applications (IAC) “M. Picone” – National Council Research. This talk can be considered as the natural evolution of what I discussed in the IPCS satellite of ECCS conference. In the past I used two graph entropies (connectivity and approximate von Neumann) for studying the dynamics of the idiotypic network (a network-based model of the mammal immune system) (IN), here I defined a new entropy, the so-called persistent entropy, that it is based on the persistent intervals of a persistent barcode. We have numerical evidences that this entropy is able to capture the entire dynamics of the IN. For the sake of clarity, this entropy is based on the idea presented in the paper edited by Gonzalez-Diaz et. al, in “an entropy-based persistence barcode”. Slides of the talk are available to download.